The region known as “the Guianas” consists of the large shield landmass north of the Amazon River and east of the Orinoco River known as the “land of many waters”. 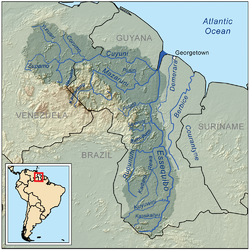 Major rivers in Guyana include the Essequibo, the Berbice, and the Demerara. Originally inhabited by many indigenous groups, Guyana was settled by the Dutch before coming under British control in the late 18th century. It was governed as British Guiana, with a mostly plantation-style economy until the 1950s. It gained independence in 1966, and officially became a republic within the Commonwealth of Nations in 1970. The legacy of British rule is reflected in the country’s political administration and diverse population, which includes Indian, African, Amerindian, and multiracial groups. Guyana is the only South American nation in which English is the official language. The majority of the population, however, speak Guyanese Creole, an English-based creole language, as a first language. Guyana is part of the Anglophone Caribbean. CARICOM, of which Guyana is a member, is headquartered in Guyana’s capital and largest city, Georgetown. In 2008, the country joined the Union of South American Nations as a founding member. Guyana achieved independence from the United Kingdom on 26 May 1966 and became a republic on 23 February 1970, remaining a member of the Commonwealth. The US State Department and the US Central Intelligence Agency (CIA), along with the British government, played a strong role in influencing political control in Guyana during this time. The American government supported Forbes Burnham during the early years of independence because Cheddi Jagan was identified as a Marxist. They provided secret financial support and political campaign advice to Burnham’s People’s National Congress, to the detriment of the Jagan-led People’s Progressive Party, which was mostly supported by Guyanese of East Indian background. In 1978, Guyana received international notice when 918 members of the American cult, Peoples Temple, died in a mass murder/suicide drinking cyanide-laced Flavor Aid. However, most of the suicides were by Americans and not Guyanese. More than 300 children were killed; the people were members of a group led by Jim Jones in Jonestown, the settlement which they had created. Jim Jones’s bodyguards had earlier attacked people taking off at a small remote airstrip close to Jonestown, killing five people, including Leo Ryan, a US congressman. The country can be divided into five natural regions; a narrow and fertile marshy plain along the Atlantic coast (low coastal plain) where most of the population lives; a white sand belt more inland (hilly sand and clay region), containing most of Guyana’s mineral deposits; the dense rain forests (Forested Highland Region) in the southern part of the country; the drier savannah areas in the south-west; and the smallest interior lowlands (interior savannah) consisting mostly of mountains that gradually rise to the Brazilian border. Some of Guyana’s highest mountains are Mount Ayanganna (2,042 metres or 6,699 feet), Monte Caburaí (1,465 metres or 4,806 feet) and Mount Roraima (2,772 metres or 9,094 feet – the highest mountain in Guyana) on the Brazil-Guyana-Venezuela tripoint border, part of the Pakaraima range. Mount Roraima and Guyana’s table-top mountains (tepuis) are said to have been the inspiration for Sir Arthur Conan Doyle‘s 1912 novel The Lost World. There are also many volcanic escarpments and waterfalls, including Kaieteur Falls which is believed to be the largest water drop in the world. North of the Rupununi River lies the Rupununi savannah, south of which lie the Kanuku Mountains. Map of Guyana, showing the Essequibo River and (shaded dark) the river’s drainage basin. Venezuela claims territory up to the western bank of the river. The historical claim by the UK included the river basin well into current-day Venezuela. 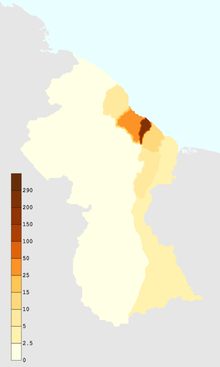 Guyana is in border disputes with both Suriname, which claims the area east of the left bank of the Corentyne River and the New River in southwestern Suriname, and Venezuela which claims the land west of the Essequibo River, once the Dutch colony of Essequibo as part of Venezuela’s Guayana Essequiba. The maritime component of the territorial dispute with Suriname was arbitrated by the United Nations Convention on Law of the Sea, and a ruling was announced on 21 September 2007. The ruling concerning the Caribbean Sea north of both nations found both parties violated treaty obligations and declined to order any compensation to either party. 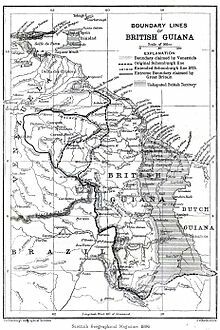 When the British surveyed British Guiana in 1840, they included the entire Cuyuni River basin within the colony. 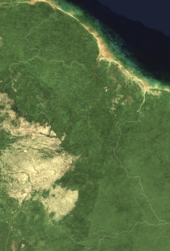 Venezuela did not agree with this as it claimed all lands west of the Essequibo River. In 1898, at Venezuela’s request, an international arbitration tribunal was convened, and in 1899 the tribunal issued an award giving about 94% of the disputed territory to British Guiana. The arbitration was concluded, settled and accepted into International law by both Venezuela and the U.K. Venezuela brought up again the settled claim, during the 1960s cold war period, and during Guyana’s Independence period. This issue is now governed by the Treaty of Geneva of 1966, which was signed by the Governments of Guyana, Great Britain and Venezuela, and Venezuela continues to claim Guayana Esequiba. Venezuela calls this region “Zona en Reclamación” (Reclamation Zone) and Venezuelan maps of the national territory routinely include it, drawing it in with dashed lines. More than 80% of Guyana is still covered by forests, those forest also contains the worlds rarest orchids ranging from dry evergreen and seasonal forests to montane and lowland evergreen rain forests. These forests are home to more than a thousand species of trees. Guyana’s tropical climate, unique geology, and relatively pristine ecosystems support extensive areas of species-rich rain forests and natural habitats with high levels of endemism. Approximately eight thousand species of plants occur in Guyana, half of which are found nowhere else. In February 2004, the Government of Guyana issued a title to more than 1 million acres (4,000 km2) of land in the Konashen Indigenous District declaring this land as the Konashen Community-Owned Conservation Area (COCA), to be managed by the Wai Wai. In doing so Guyana created the world’s largest Community-Owned Conservation Area. This important event followed a request made by the Wai Wai community to the government of Guyana and Conservation International Guyana (CIG) for assistance in developing a sustainable plan for their lands in Konashen. The three parties signed a Memorandum of Cooperation which outlines a plan for sustainable use of the Konashen COCA’s biological resources, identifies threats to the area’s biodiversity, and helps develop projects to increase awareness of the COCA as well as generate the income necessary to maintain its protected status. The Konashen Indigenous District of Southern Guyana houses the headwaters of the Essequibo River, Guyana’s principal water source, and drains the Kassikaityu, Kamoa, Sipu and Chodikar rivers. Southern Guyana is host to some of the most pristine expanses of evergreen forests in the northern part of South America. Most of the forests found here are tall, evergreen hill-land and lower montane forests, with large expanses of flooded forest along major rivers. Thanks to the very low human population density of the area, most of these forests are still intact. The Smithsonian Institution has identified nearly 2,700 species of plants from this region, representing 239 distinct families, and there are certainly additional species still to be recorded. Kaieteur Falls is the world’s largest single-drop waterfall by volume. 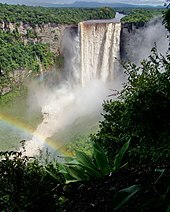 Guyana submitted the Kaieteur National Park, including the Kaieteur Falls, to UNESCO as its first World Heritage Site nomination. The proposed area and surrounds have some of Guyana’s most diversified life zones with one of the highest levels of endemic species found in South America. The Kaieteur Falls are the most spectacular feature of the park, falling a distance of 226 metres. 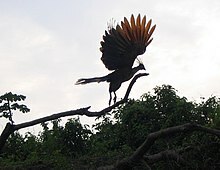 The nomination of Kaieteur National Park as a World Heritage Site was not successful, primarily because the area was seen by the evaluators as being too small, especially when compared with the Central Suriname Nature Reserve that had just been nominated as a World Heritage Site (2000). The dossier was thus returned to Guyana for revision. Guyana holds two of the World Wildlife Fund‘s Global 200 eco-regions, the Guianan and Guiana Highlands moist forests. It is also home to several endemic species including the greenheart tree. The world’s fourth-longest floating bridge. The world’s sixth-longest floating bridge. Presented as a gift from the People’s Republic of China to the Government of Guyana. It is the only one of its kind in the country. 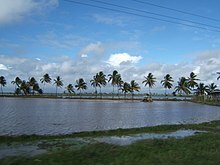 The main economic activities in Guyana are agriculture (production of rice and Demerara sugar), bauxite and gold mining, timber, shrimp fishing and minerals. The sugar industry, which accounts for 28% of all export earnings, is largely run by the company GuySuCo, which employs more people than any other industry. Many industries have a large foreign investment. For example, the American company Reynolds Metals and the British-Australian Rio Tinto’s Rio Tinto Alcan subsidiary are heavily invested in Guyana’s mineral industry; the Korean/Malaysian Barama Company has a large stake in the logging industry. Since 2015, foreign companies have made several significant deep water oil discoveries. Chronic problems include a shortage of skilled labour, deficient infrastructure, and until recently, sizable external debt. Low prices for key mining and agricultural commodities, combined with troubles in the bauxite and sugar industries, had threatened the government’s tenuous fiscal position and dimmed prospects for the future. However, the Guyanese economy has rebounded slightly and exhibited moderate economic growth since 1999, thanks to an expansion in the agricultural and mining sectors, a more favourable atmosphere for business initiatives, a more realistic exchange rate, fairly low inflation, and the continued support of international organisations. In 2008, the economy witnessed a 3% increase in growth amid the global economic crisis. It grew 5.4% in 2011 and 3.7% in 2012. On 30 June 2014, Guyana signed a Model 1 agreement with the United States of America in relation to the Foreign Account Tax Compliance Act (FATCA). This Model 1 agreement includes a reference to the Tax Information Exchange Agreement (Clause 3) which was signed on 22 July 1992 in Georgetown, Guyana intending to exchange Tax information on an automatic basis. The chief majority (about 90%) of Guyana’s 773,000 population lives along a narrow coastal strip which ranges from a width of 16 to 64 kilometres (10 to 40 mi) inland and which makes up approximately only 10% of the nation’s total land area. Among Christians, most are Protestants (34.8%) or other Christian (20.8%), but there is also a minority of Roman Catholics (7.1%). Among Hindu, Vaishnavism is the major tradition. Among Muslims, Sunni are in the majority, while there are also Shia and Ahmadiyya minorities. Among other religions, the Rastafari movement, Buddhism, and the Baha’i Faith are the most popular. The politics of Guyana takes place in a framework of a presidential representative democratic republic, in which the President of Guyana is both head of state and head of government, and of a multi-party system. Executive power is exercised by the President and the Government. Legislative power is vested in both the President and the National Assembly of Guyana. Historically, politics are a source of tension in the country, and violent riots have often broken out during elections. During the 1970s and 1980s, the political landscape was dominated by the People’s National Congress. In 1992, the first “free and fair” elections were overseen by former United States President Jimmy Carter, and the People’s Progressive Party led the country until 2015. The two parties are principally organised along ethnic lines and as a result often clash on issues related to the allocation of resources. In the General Elections held on 28 November 2011, the People’s Progressive Party (PPP) retained a majority, and their presidential candidate Donald Ramotar was elected as President. There are a total of 187 kilometres (116 mi) of railway, all dedicated to ore transport. There are 7,969 kilometres (4,952 mi) of highway, of which 591 kilometres (367 mi) are paved. Navigable waterways extend 1,077 kilometres (669 mi), including the Berbice, Demerara, and Essequibo rivers. There are ports at Georgetown, Port Kaituma, and New Amsterdam. There are two international airports (Cheddi Jagan International Airport, Timehri and Eugene F. Correira International Airport (formerly Ogle Airport); along with about 90 airstrips, nine of which have paved runways. Guyana, Suriname and the Falkland Islands are the only three regions in South America which drive on the left. Guyana lacks a critical mass of expertise in many of the disciplines and activities on which it depends. At 88.5%, Guyana’s literacy rate is the lowest in South America. Guyana’s culture is very similar to that of the English-speaking Caribbean, and has historically been tied to the English-speaking Caribbean as part of the British Empire when it became a possession in the nineteenth century. Guyana is a founding member of the Caricom (Caribbean Community) economic bloc and also the home of the Bloc’s Headquarters, the CARICOM Secretariat. Guyana’s geographical location, its sparsely populated rain-forest regions, and its substantial Amerindian population differentiate it from English-speaking Caribbean countries. Its blend of Indo-Guyanese (East Indian) and Afro-Guyanese (African) cultures gives it similarities to Trinidad and distinguishes it from other parts of the Americas. Guyana shares similar interests with the islands in the West Indies, such as food, festive events, music, sports, etc. ^ Mostly made up of other Protestants, but also Eastern Orthodox, Mormons, Jehovah’s Witnesses and other Christians. ^ a b c d “World Economic Outlook Database, October 2018”. IMF.org. International Monetary Fund. Retrieved 9 February 2019. ^ “2018 Human Development Report” (PDF). United Nations Development Programme. 2018. Archived (PDF) from the original on 22 March 2017. Retrieved 14 September 2018. ^ “Guyana – Dictionary definition and pronunciation – Yahoo! Education”. Education.yahoo.com. Archived from the original on 29 October 2013. Retrieved 30 March 2014. ^ “Independent States in the World”. state.gov. Archived from the original on 9 June 2010. Retrieved 24 June 2017. “Guyana”. Oxford Dictionaries. Archived from the original on 7 July 2015. Retrieved 9 May 2015. ^ “Ministry of Amerindian Affairs – Georgetown, Guyana”. Amerindian.gov.gy. Archived from the original on 2 June 2013. Retrieved 30 March 2014. ^ “South America 1744–1817 by Sanderson Beck”. Archived from the original on 1 January 2017. Retrieved 24 October 2016. ^ Rowe, Mark (14 November 2004). “South America: Do the continental: The best of what’s new; spectacular waterfalls, forgotten cities, pre-Inca trails”. The Independent. p. Features, page 3. ^ “Government of Guyana, Statistics” (PDF). Archived (PDF) from the original on 13 November 2009. Retrieved 2 May 2010. ^ “Guyana ponders judicial action in border dispute with Venezuela”. FoxNews Latino. 23 December 2014. Archived from the original on 22 February 2015. Retrieved 22 February 2015. ^ “Guyana to experience ‘massive’ oil exploration this year”. Landofsixpeoples.com. 5 February 2007. Archived from the original on 24 August 2010. Retrieved 2 May 2010. ^ “News in the Caribbean”. Caribbean360.com. 27 April 2007. Archived from the original on 29 September 2007. Retrieved 2 May 2010. ^ Foreign affairs minister reiterates Guyana’s territorial sovereignty Archived 12 November 2014 at the Wayback Machine. CaribbeanNetNews.com (17 February 2010). ^ “official site of the Permanent Court of Arbitration”. Pca-cpa.org. Archived from the original on 8 February 2013. Retrieved 2 May 2010. ^ Ishmael, Odeen (1998, rev. 2006) “The Trail Of Diplomacy: A Documentary History of the Guyana-Venezuela Border Issue” Archived 28 June 2009 at the Wayback Machine Dr. Ishmael was Ambassador of Guyana to Venezuela when this was written. ^ “Mapa Politico de Venezuela”. A-venezuela.com. Archived from the original on 20 February 2010. Retrieved 2 May 2010. ^ Ramjeet, Oscar (28 October 2008). “Guyana and Suriname border dispute continues despite UN findings”. Caribbean Net News. Archived from the original on 28 February 2014. Retrieved 15 December 2008. ^ Rodrigues-Birkett, Carolyn (24 October 2008). “There is no agreement recognizing Suriname’s sovereignty over the Corentyne River”. Stabroek Newspaper. Archived from the original on 3 May 2012. Retrieved 15 December 2008. 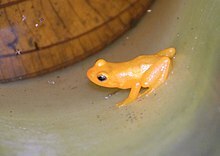 ^ “Biodiversity in the Konashen Community-Owned Conservation Area, Guyana” (PDF). Archived from the original (PDF) on 6 December 2010. Retrieved 2 May 2010. ^ RedSpider, Romona Khan. “Private Sector Commission”. Psc.org.gy. Archived from the original on 28 June 2010. Retrieved 2 May 2010. ^ “Georgetown Chamber of Commerce & Industry (GCCI)”. Georgetownchamberofcommerce.org. Archived from the original on 17 December 2010. Retrieved 2 May 2010. ^ a b “The World Factbook: Guyana”. CIA. Archived from the original on 15 January 2014. Retrieved 6 January 2014. ^ OAS (1 August 2009). “OAS – Organization of American States: Democracy for peace, security, and development”. oas.org. Archived from the original on 14 October 2016. Retrieved 3 January 2017. ^ OAS (1 August 2009). “OAS – Organization of American States: Democracy for peace, security, and development”. oas.org. Archived from the original on 22 December 2016. Retrieved 3 January 2017. ^ “Indigenous Peoples”. summit-americas.org. Archived from the original on 13 April 2012. Retrieved 3 January 2017. ^ “Events OAS Indigenous Special Events”. oas.org. Archived from the original on 4 January 2017. Retrieved 3 January 2017. ^ “IRD Trinidad and Tobago – CARICOM Treaties” (PDF). ird.gov.tt. Archived (PDF) from the original on 7 May 2016. Retrieved 27 December 2016. ^ “Foreign Account Tax Compliance Act (FATCA)”. treasury.gov. Archived from the original on 13 January 2017. Retrieved 16 January 2017. 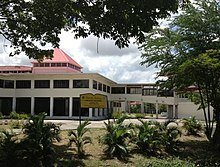 ^ “Guyana General Information”. Geographia.com. Archived from the original on 11 April 2010. Retrieved 2 May 2010. ^ “Guyana turns attention to racism Archived 2 December 2010 at the Wayback Machine“. BBC News. 20 September 2005. ^ “Conflict between Guyanese-Indians and Blacks in Trinidad and Guyana Socially, Economically and Politically Archived 2 December 2010 at the Wayback Machine“. Gabrielle Hookumchand, Professor Moses Seenarine. 18 May 2000. ^ “Biggest Cities Guyana”. Archived from the original on 19 October 2014. Retrieved 1 September 2014. ^ “Data” (PDF). state.gov. Archived (PDF) from the original on 6 December 2017. Retrieved 11 December 2017. ^ “Final 2002 Census Compendium 2” (PDF). gov.gy. Archived from the original (PDF) on 1 January 2017. ^ Svetlana Marshall (21 March 2019). “Ruling on confidence vote appeal Friday”. Guyana Chronicle. ^ “LGBT relationships are illegal in 74 countries, research finds”. The Independent. 17 May 2016. Archived from the original on 27 August 2017. Retrieved 29 August 2017. ^ “WHO Report 2014 Preventing suicide: A global imperative” (PDF). Archived (PDF) from the original on 16 June 2015. Retrieved 4 August 2015. ^ “Desperate measures”. 13 September 2014. Archived from the original on 10 June 2017. Retrieved 29 August 2017 – via The Economist. ^ UIS. “Education”. data.uis.unesco.org. Archived from the original on 5 September 2017. Retrieved 30 October 2017. ^ “Composition and countries”. W.I Cricket team. West Indies Cricket Board. Archived from the original on 3 January 2014. Retrieved 27 November 2013. ^ “SPORTS, LITERATURE”. Guyana News and Information. Archived from the original on 4 March 2016. Retrieved 30 November 2015. ^ “Providence stadium – Records and statistics”. Cricket World 4U. Archived from the original on 2 December 2013. Retrieved 27 November 2013. ^ Service, K News (11 July 2013). “Guyana Horse Racing Authority continues its drive to regularize the sport”. Kaiteur News. Archived from the original on 3 December 2013. Retrieved 27 November 2013. Cheddi Jagan. My Fight For Guyana’s Freedom: With Reflections on My Father by Nadira Jagan-Brancier. John Gimlette, Wild Coast: Travels on South America’s Untamed Edge, 2011. “Guyana”. The World Factbook. Central Intelligence Agency. The State of the World’s Midwifery, Guyana Country Profile.